In 1829 two stone beacons were erected near the beach that had to be aligned by ships sailing into Algoa Bay from the west so that they could avoid the very dangerous Roman Rock. In 1858 they were replaced by two new stone beacons. These were painted red and white with a black ball on top. 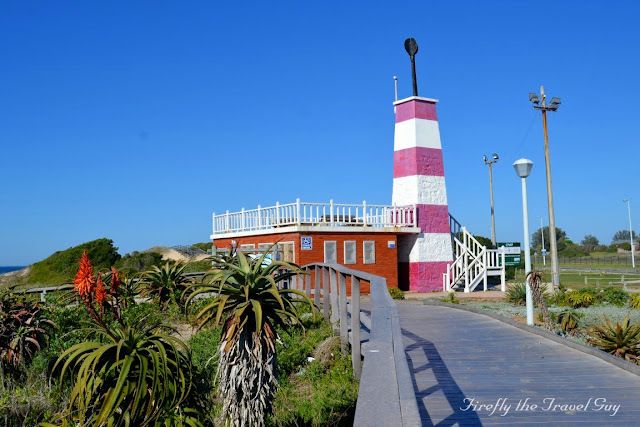 The one beacon is located in the Cape Recife Nature Reserve near the lighthouse while the other one, usually referred to as the Lolipop Beacon, stands on the corner of Marine Drive and Admiralty Way. The beacon was called the Admiralty Beacon, and hence the name of the road. That'll stand out from a distance! Recife and the Lollipop and Admiralty beacons indicates the location of Roman Rock. The Bell bouy is on the sea side of the rock and ships pass outside of the bell bouy.